Practitioners and researchers have identified lifelong sport and active recreation participation as positive contributors to individual health and well-being, social capital, community development and economic outcomes (for example, reduced health-care costs)1-4. While structured sport activities provide an avenue to engage in competitive pursuits and develop strong social connections with others, active recreation provides a more unstructured physical activity space that individuals can use freely in their leisure time and achieve a personal sense of enjoyment5. Similar to other forms of physical activity such as active living (the integration of physical activity into everyday routines at home, school, work or at play), participation in sport and active recreation improves women’s and girl’s overall health and physical, social and emotional well-being, as well as reducing stress levels and the risk of chronic diseases6,7. Yet women and girls are less likely to take part in sport and active recreation compared to their male counterparts. Statistical data from a range of countries (for example, Australia, Germany, United Kingdom and the USA) indicate that males participate more frequently than females in sport and more often in team sports8-10. Differences in participation rates are also apparent among groups of women. For example, it could be expected that younger women and working women would be more likely to participate in sport and active recreation compared to women with young children, due to the lack of time available to mothers who hold substantial caring roles within the family environment. While women generally are positioned as an ‘at risk’ population due to their lack of physical activity, women with young children are seen to be at higher risk as they are even less likely to engage in adequate physical activity to manage their own health11,12. For instance, compared with mothers of older children or childless women, mothers of very young children engage in fewer out-of-home activities and are likely to do no physical activity other than walking for transport and housework13. Overall patterns of participation highlight trends which reveal ‘inequalities in participation’. Such trends can be used to identify specific groups who are ‘priority groups’ (e.g. women with young children) in terms of sport and active recreation development. Focusing initiatives to promote and increase participation among priority groups is a key feature of sport development14. While the benefits of sport and active recreation for women and girls (and barriers to participation) are well established, this article aims to explore ‘benefits and barriers’ for a particular group of women (i.e. mothers of young children) and provide a conceptual framework to consider how organisational practices can facilitate better inclusion of this group of women in community sport and active recreation. There is irrefutable evidence of the preventive role of physical inactivity in the development of chronic disease and premature death15. In adults, strong evidence exists linking sedentary behaviour to overweight and obesity, cardiovascular disease, adverse metabolic profiles, osteoporosis, diabetes, cancer, hypertension, depression and reduced psychosocial functioning. The rise in overweight/obesity and low prevalence of physical activity of both adult and young women is of particular concern. 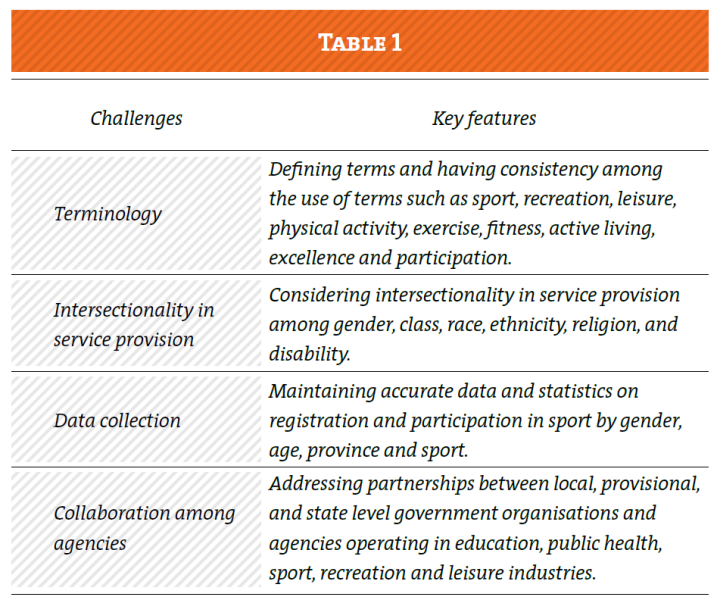 While barriers to participation in sport and active recreation are wide-ranging (e.g. age-related increases in sedentary behaviour) and well-documented, there is strong evidence to suggest that increasing participation levels in physical activity can lead to additional improvements in the health status and well-being of women15. This is particularly important for groups of women (including those with young children) who are less likely to engage in adequate physical activity for both physical and mental health benefits16. The social and psychological gains to be found through participation in sport and active recreation cannot be underestimated. For women and girls, competitive sport and regular physical activity provides opportunities for self-expression, improved self-esteem, body confidence, socialising and community identity. Sport and active recreation participation facilitates good feelings about oneself, opportunities to be with friends and the development and maintenance of a good appearance17. Physical activity has also been shown to reduce depression, anxiety, psychological distress and emotional disturbance among women and girls. While previous studies indicate that sport and active recreation improves mood states and well-being18 in younger19 and older women20, for women with young children it can specifically lead to a reduction in depressive symptoms for those diagnosed with postnatal depression21. A review of the benefits of physical activity for the psychological well-being of women postnatally suggests that active women are more satisfied with motherhood and with their partners22. Importantly for mothers, physical activity is a site for freedom, pleasure, choice and personal growth and offers the potential for individuals to find personal empowerment through challenging structures embedded in social life23,24. Spowart et al25 and Currie26 suggest that physical activity enables women with young children to experience feelings of happiness, fulfilment and embodied pleasure, along with feelings of strength and empowerment. Further research suggests that physical activity results in a greater improvement in mothers’ well-being and a significant reduction in maternal symptoms of depression, regardless of the amount of physical activity27. These observations are supported by reports that “a single session of exercise can result in both an increase in positive mood states (e.g. feeling positive, more energetic, happy and more refreshed) and a decrease in negative mood states (e.g. tension, anxiety, confusion)”27. Overall, participation in structured or unstructured physical activity programmes increases the psychological well-being (and reduces depression) of women with young children. Yet, although the evidence suggests that physical activity can be an ‘effective lifestyle intervention’ that could be used to both prevent and treat a wide range of physical and mental health problems and to improve overall quality of life3, not all women and girls in many parts of the world have safe and affordable access to physically active lifestyles. Women (and in particular mothers) have a strong influencing role within their own families and are seen as important role models of healthy living. Family members who play sport often influence other family members and girls are more influenced by ‘physically active’ mothers than sporting heroes or big sporting events. Research also suggests that children and in particular very young children, may not be inclined to participate in physical activity if habitually sedentary lifestyles are reinforced by their parents28. Therefore, children’s dependency on their parents (and particularly their mothers) to be ‘responsible adults’ and encourage family-based activities that facilitate physical activity, places an added burden on mothers to act as role models for acceptable behaviour29 and to deliver health policy outcomes16. Participation in sport and active recreation is influenced by a broad range of factors such as age, ethnicity, economic and disability. 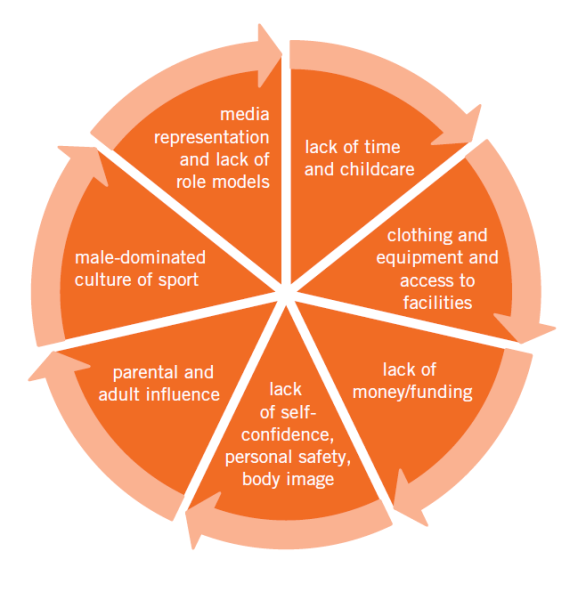 For women, there are a number of barriers to playing sport and being physically active, including lack of time and childcare, clothing and equipment, lack of money, lack of self-confidence, personal safety, parental and adult influence, funding, male-dominated culture of sport, access to facilities and body image. Women often express concerns about making physical activity a priority in their lives; in the case of sport participation, competition and expectations surrounding the participation environment can often be confronting and overwhelming for many women. Among girls, the barriers that limit participation in various sport and recreation activities are widespread and include concerns about safety, lack of time, school and home obligations and lack of encouragement from family members, friends and adult recreation leaders30,31. Celio, Zabinski and Wilfey32 suggest that young girls are vulnerable to feelings of acceptance among their peers and rely heavily on the approval of others before engaging in a sport, recreation and leisure activity (Figure 1). Specifically for women with young children, time pressure (i.e. feelings of time scarcity), fatigue, obligations to other roles (e.g. family and/or work commitments) and lack of social support and childcare are significant barriers to participation33-36. Further, the ‘ethic of care’ has been identified as an impediment to mothers' ability to prioritise their own physical activity needs over domestic responsibilities. In addition (and as mentioned previously), women with young children often prioritise and assume the responsibility for the health and physical activity levels of their children and family and this subsequently impinges on their own experiences of physical activity16. This additional ‘burden of care’ has the potential to impact negatively on women's own well-being. There is a growing body of literature about the most effective ways to motivate and support women and girls to take up sport. To get more people playing sport, it is important to understand both women and girls' lifestyles and motivation. Motives to participate can change and evolve over time. For example, women with young children may begin physical activity for health reasons, however find enjoyment in the social aspect or mental well-being and continue for those reasons. Therefore, understanding an individual’s needs, attitudes, experiences and behaviours across the lifespan is important for increasing participation among women with young children. For instance, structured and unstructured activities that focus on opportunities for women with young children to feel empowered through participation are vital. Programmes that move away from a ‘prescriptive focus’ and pay attention to individualised solutions to health and well-being will be more effective in attracting women and girls to engage in sport more regularly. Recognising the everyday meanings of womens' experiences, such as changes in gendered embodiment and enjoyment that women have identified as important to their engagement with sport and active recreation is also crucial37,38. Sport, recreation and leisure service agencies can play a role in promoting healthy behaviours and increased levels of physical activity among women with young children, by providing opportunities and spaces (e.g. including childcare in some cases) for them to participate in various activities. Research indicates that programmes which are considerate of what women and girls ‘value’ are likely to be more successful. For instance, programme attributes that encourage more activity and retention of participation in healthy activities (such as opportunities to socialise with friends, freedom to be creative, involvement in the programme development process and opportunities to express their femininity through leisure) are viewed as more favourable39. Positive action initiatives such as providing more equal and sensitive access to provision are also important14. Once again, administrators and managers need to be aware of the specific interests of women and girls to provide or modify sport and recreation opportunities that will encourage participation in healthy leisure activities. Programme facilitators who are better able to address the unique needs of women and girls can positively impact their health and active recreation involvement. · domestic and international co-operation. · Policy and strategy – governments have an important role to play in creating policy and providing funding for sport programmes for women and girls to enhance the quality or sport and active recreation programme implementation. For example, universities and other educational institutions are a useful resource to generate and transfer knowledge about the value of sport and active recreation to individuals and communities. · Professional and institutional – professional development of teachers, coaches and community workers on good practices in sport and gender is needed to enhance the quality and sustainability of sport and recreation experiences for women and girls. Promoting women as physical education teachers and giving young women the role models they need to motivate them to participate in sport can have a positive impact on the development of academic and life skills. · Personal and social – fostering environments where women and girls feel comfortable participating in sport is essential for personal and social development. Specifically for women with young children, the physical activity needs of mothers need to be recognised at a societal level as being equally as valid as those of men and children. Strategies that address gender differences in free time, societal norms about entitlement to sport and active recreation and the cultural beliefs that affect household negotiations about physical activity participation are important considerations36. · terminology and data collection processes (Table 1). These findings illustrate a need to focus on the individual as well as the societal, cultural and environmental constraints to women and girls’ participation in sport and active recreation more broadly, and mothers’ participation more specifically. This article has explored the benefits of participation in sport and active recreation and barriers to participation with a particular focus on women with young children. The benefits of sport and active recreation are wide-ranging including: prevention and management of disease, increased health, fitness, body and bone strength, weight loss and prevention of obesity, reduced risks of mortality, improved mental health and improved well-being, increase in social connections and enjoyment. Specifically for women with young children, barriers to participation include time constraints, the 'ethic of care' and lack of social support and childcare. Identifying barriers to participation can facilitate the actions and outcomes required to engage women in lifelong sport and active recreation. However, understanding and addressing the barriers preventing more female participation in physical activity is complex. Evidence shows that gender and the needs of females across the life course should be considered when developing specific physical activity, sport and active recreation opportunities. The pursuit of greater participation among women and girls (and specifically women with young children) in physical activity, sport and active recreation is encouraging. Even having a low level of physical activity is better for health than not being active at all. A framework for understanding how organisations can facilitate the inclusion and retention of this group of women (i.e. mothers of young children) is important for growing participation. Individuals, community groups and sport/recreation-related organisations all have an important role to play in providing opportunities for women and girls (particularly mothers of young children) to engage in lifelong health enhancing physical activity. Chalip L. Toward a distinctive sport management discipline. JSM 2006; 20: 1-21. Houlihan B, Green M. (eds.). In: Routledge Handbook of Sports Development. London: Routledge 2010. Ekkekakis P. Physical activity as a mental health intervention in the era of managed care: a rationale. In: Routledge Handbook of Physical Activity and Mental Health. London: Routledge 2013. p. 1-32. Penedo F, Dahn J. Exercise and well-being: a review of mental and physical health benefits associated with physical activity. Curr Opin Psychiatry 2005; 18: 189-193. Frankish C, Milligan D, Reid C. A review of relationships between active living and determinants of health. Soc Sci Med 1998; 47: 287-301. Public Health Agency of Canada. The Benefits of Physical Activity. From http://www.phac-aspc.gc.ca/hp-ps/hl-mvs/pa-ap/03paap-eng.php Accessed September 21, 2014. Allender S, Peto V, Scarborough P et al. Coronary Heart Disease Statistics. British Heart Foundation, London 2006. Australian Bureau of Statistics. Sports and Physical Recreation: A Statistical Overview 2012. Cat No. 4156.0. Commonwealth of Australia, Canberra. Wattie N, Tietjens M, Cobley S, Schorer J, Baker J, Kurz D. Relative age-related participation and dropout trends in German youth sports clubs. 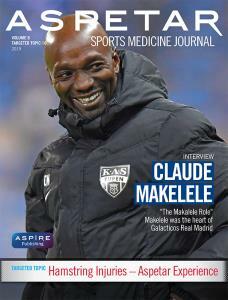 Eur J Sport Sci 2014; 14:S213-S220. Brown W, Brown P, Powers J. Time pressure, satisfaction with leisure and health among Australian women. ALR 2001; 4:1–18. Lupton D. In: Risk. London: Routledge 1999. Deem R, Gilroy S. Physical activity, life‐long learning and empowerment—situating sport in women’s leisure. Sport, Education and Society 1998; 3: 89-104. Hylton K, Totten M. Developing ‘Sport for All’. In: Sports Development. York: Routledge 2013. Warburton D, Nicol C, Bredin S. Health benefits of physical activity: the evidence. CMAJ 2006; 174:801-809. Ponic P, Frisby W. Unpacking assumptions about inclusion in community-based health promotion: perspectives of women living in poverty. QHR 2010; 20:1519-1531. Berger B, Motl R. Exercise and mood: a selective review and synthesis of research employing the profile of mood states. J App Sport Psych 2000; 12:69 –92. Annesi J. Mood states of formerly sedentary younger and older women at weeks 1 and 10 of a moderate exercise program. Psychol Rep 2010; 94:1337–1342. Lee C, Russell A. Effects of physical activity on emotional well-being among older Australian women: cross-sectional and longitudinal analyses. J Psychosom Res 2003. 54:155–160. Armstrong K, Edwards H. The effects of exercise and social support on mothers reporting depressive symptoms: a pilot randomized controlled trial. Int J Ment Health Nurs 2003; 12:130–138. Sampselle C, Seng J, Yeo S. Physical activity and postpartum well-being. J Obstet Gynecol Neonatal Nurs 1999; 28:41–49. Dionigi R. Resistance and empowerment through leisure: the meaning of competitive sport participation to older adults. Society and Leisure 2002; 25:303-328. Green E. ‘Women doing friendship’: an analysis of women’s leisure as a site of identify construction, empowerment and resistance. Leisure Studies 1998; 17:171-185. Spowart L, Burrows L, Shaw S. ‘I just eat, sleep and dream of surfing’: when surfing meets motherhood. Sport in Society: Cultures, Commerce, Media, Politics 2010. 13:1186-1203. Currie J. Motherhood stress and the exercise experience: freedom or constraint. Leisure Studies 2004; 23:225-242. Norman E, Sherburn M, Osborne R, Galea M. An exercise and education program improves well-being of new mothers: a randomized controlled trial. Physical Therapy 2010; 90:348-355. Franks P, Ravussin E, Hanson R. Habitual physical activity in children: The role of genes and environment. American Journal of Clinical Nutrition 2005; 82: 901–908. Hills A, King, N, Armstrong T. The contribution of physical activity and sedentary behaviours to the growth and development of children. Sports Med 2007; 37:533–545. Casper J, Bocarro J. Kanters M, Floyd M. "Just let me play!" - understanding constraints that limit adolescent sport participation. J Phys Act Health 2011; 8:s32-s39. Slater A, Tiggemann M. "Uncool to do sport": A focus group study of adolescent girls' reasons for withdrawing from physical activity. Psych Sport Exercise 2010; 11:619-626. 32.Celio A, Zabinski M, Wilfey D. African American body images. In: Cash T, Pruzinsky T (eds) Body image: a handbook of theory, research, and clinical practice. New York, NY: Guilford Press 2002. p. 234-242. Bellow-Riecken K, Rhodes R. A birth of inactivity? A review of physical activity and parenthood. Prev Med 2007; 46:99-110. Jabs J, Devine C, Bisogni C, Farrell T, Jastran M, Wethington E. Trying to find the quickest way: employed mothers’ constructions of time for food. J Nutr Educ Behav 2007; 39:18–25. Mailey E, Huberty J, Dinkel D, McAuley E. Physical activity barriers and facilitators among working mothers and fathers. BMC Public Health 2014; 14. Miller Y, Brown W. Determinants of active leisure for women with young children: an “ethic of care” prevails. Leisure Sci 2005; 27:405-420. Velija P, Mierzwinski M, Fortune L. “It made me feel powerful”: women’s gendered embodiment and physical empowerment in the martial arts. Leisure Studies 2013; 32:524-541. Bennett E, McEwen C, Clarke L, Tamminen K, Crocker P. “It’s all about modifying your expectations”: Women’s experiences of physical activity during pregnancy. Qualitative Research in Sport, Exercise and Health 2013; 5:267-286. Burk B, Shinew K. Factors That Impact African American Girls' Participation in Health-Promoting Leisure Activities. Journal of Park & Recreation Administration 2013; 31. Kirk D. Empowering Girls and Women through Physical Education and Sport - Advocacy Brief. Bangkok: UNESCO Bangkok 2012.